Burkina Faso midfielder Djakaridja Kone has warned his team mates to "concentrate" and "continue working" if they want to qualify for the quarter-finals of the Africa Cup of Nations. The Stallions lead the group thanks to a 4-0 win over Ethiopia over on Friday, coupled with Nigeria and Zambia's failure to register a win in their first two games in Nelspruit. But Kone, who scored their third goal against the Waliyas, insists they still have much to do before a place in the last eight is secure. "I believe in our team - we have great players and now we have confidence," he told BBC Sport. "[But] we have to concentrate - we have to prepare well for the game against Zambia." A win or a draw in Nelspruit in that final group game will be enough for the Burkinabes to make it through. 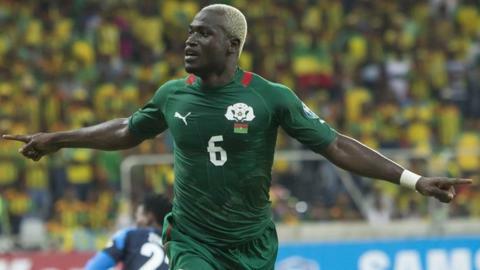 Kone praised Friday's other goalscorers, Jonathan Pitroipa and Alain Traore, who was on target twice two and is is the top scorer in South Africa 2013 so far, with three goals from two games. "Alain is a very good player - he's very good for the team, and as a midfielder I like to work with a player like Alain [up front]," he said. Meanwhile Ethiopia, who were destroyed by Burkina Faso despite the Stallions being down to 10 men for much of the game, are counting the cost of a bitter defeat which leaves them facing an early exit from their first Nations Cup in 31 years. "This is a learning situation for our squad," the president of the Ethiopian Football Federation, Salihu Gebremariam said. "We learned a lot and we'll improve for the next games. We have to play to our best [in the next game against Nigeria] - and we shall improve."